On the Saturday after the Lincoln trip, most of my friends took a day trip to York. I stayed at the manor and had a relaxing day doing homework and watching movies. 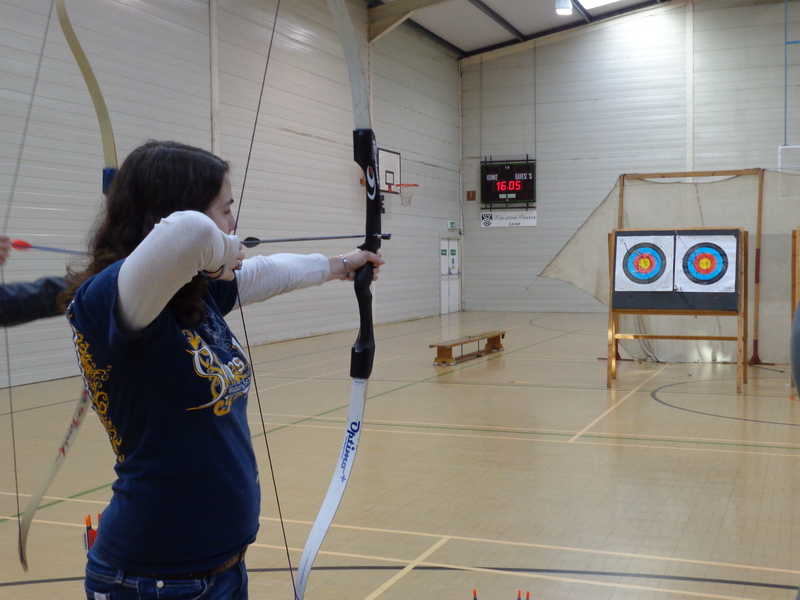 Sunday after church, an archery club from Nottingham came down to teach us how to shoot. I had only shot with a bow a few times, but I was pleased with my accuracy. Several of the club members complemented my shots, and I really enjoyed doing it. Wednesday afternoon was free like usual, so I went for a walk with a few other girls, led by my Novel’s professor. We were warned it would be a muddy walk, but it really wasn’t too bad as long as we were walking down the road and on a path beside the canal. But, when we got off the path, things got serious. We walked along a field or two, then we had to cross a little stream and climb up a short, but very steep hill. And oh yeah… there were rose bushes all along the path (just like my woods at home!). The hill was really muddy, so it was quite a challenge. After a brief rest to wait for everyone to catch up, we began to walk up the biggest hill yet, which was also very muddy. Then, my professor bet us £5 that no one could beat him up the hill. The joke was on him- one of my classmates started running up the hill, and didn’t even break stride when he briefly stumbled on his way up. To give you an idea of how steep it was, there was a set of about twelve stairs so you could reach the very top. True to his word, my professor paid her back the next class. But that’s beside the point. The view at the top of the hill was absolutely amazing. We could see for miles! On one of the distant hills, we could just make out the towers of Belvior (pronounced like “Beaver”) castle, which I hope to visit at some point later in the semester. The walk down the hill was much less of a challenge, but almost just as muddy. I was thankful to get back to the Manor after the hike. We left for Lincoln on Friday morning. This was a mandatory trip, so four coaches had to take us all. When we arrived, we walked by the Cathedral and ended up at the top of “Steep Hill” (luckily, we didn’t have to climb it- yet). We split into four groups so it would be easier to explore the city. My group went to the castle first. Construction started in 1068, soon after William the Conqueror took over England. Over the years, it became slightly more elaborate, becoming unique in it’s design. We learned all about it in class. But, we were disappointed because about 3/4’s of the outer wall and most of the building were under construction. I enjoyed walking on the part of the wall that was open, even if we had to use temporary stairs to get to the top. Since there wasn’t as much to look at, we got done early. A few friends and I decided to explore down Steep Hill, which has a very accurate name. One of my friends and I decided not to go all the way down, and after waiting on a bench outside for a while, we found a neat little cafe/bookshop in the lowest floor of one of the shop buildings. The next tour was of the Cathedrals. Like the castle, it had been added onto and improved over the centuries, especially after an earthquake caused some damage. We learned all about its architecture for class too. It was one of the most beautiful cathedrals I’ve ever been in. 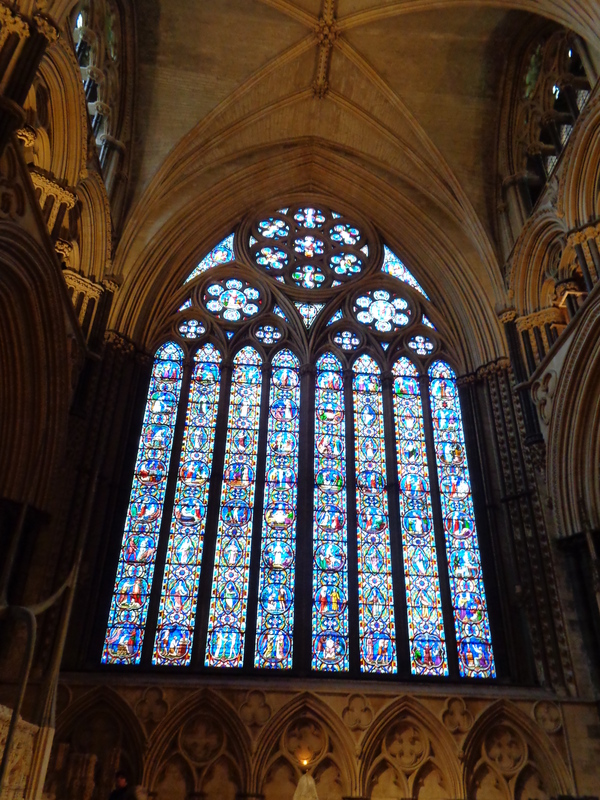 A friend and I got permission to leave the tour to attend an Anglican Communion service. It was a lot like the services at the Harlaxton Village Church except there was no sermon and no hymns. Then it was time for the Roman Walk. At this point, it was raining and the wind was blowing really hard. Many umbrellas bit the dust that day. Most of us were concerned more with trying to keep the rain out of our faces than anything else. We learned about all of the different styles of architecture and events that took place as the cathedral was being built. Across the street, a section of the Roman wall that had been built around Lincoln. They were the ones who named Lincoln (it was a Roman colonia). We also saw where their basillica (city center) well, and church would have been. We had an hour of free time so that we could explore the city. I ended up going back to the cathedral and caught the end of another tour in an attempt to hide from the rain. By the time we were ready to leave, it was dark and rainy, making the perfect environment for sleep. By the time this week of classes started, I’ve pretty much settled into a routine. We had our first British Studies quiz on Monday, along with another (last!) presentation, along with what might turn out to be our only test in Shakespeare the following Wednesday. I had a unique opportunity on Wednesday. The Royal Theatre in London, where I went to see King Lear, broadcasts around a show a month to theatres around the UK. 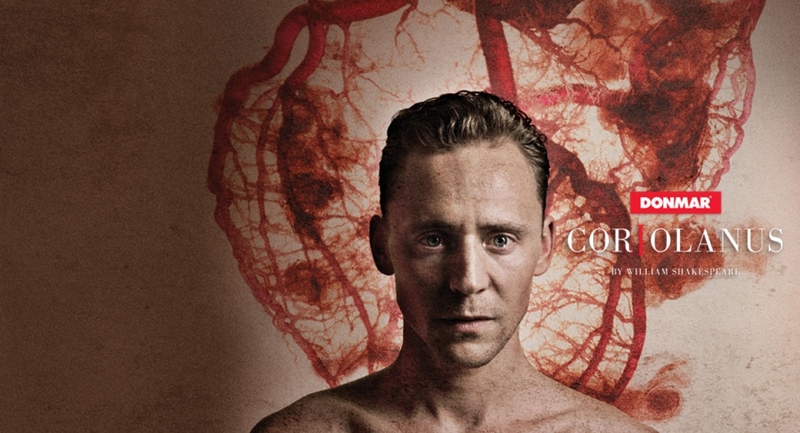 This time, they streamed another Shakespeare play, Coriolanus, to the Grantham movie theatre. This was the fist time I had watched one of his plays before I read it. There were about 12 of us, mostly theatre majors, who bought tickets for the show. We ate at a local “Inn”, which was pretty much a pub. The food was pretty good. Then we walked a few blocks down to the theatre. Coriolanus featured several famous actors, including Tom Hiddleston (who played Loki in the Thor movies and was also in War Horse) and Mark Gatkiss, (who was Mycroft in Sherlock, and also acted in Sherlock and Doctor Who). The play was performed in an old warehouse, and instead of using a lot of background set pieces and scenery, they simply used a wall with an industrial ladder and a row of chairs lined up against it. They did some really neat things with lighting, paint on the floor and walls, and throwing things like confetti and rose petals. Even though the play was a tragic history and the story was kind of sad, I was very impressed with the performance. It took us a while to get a taxi to go back to the manor because there were a lot of students in Grantham that night. But, we eventually made it home at a fairly decent hour. 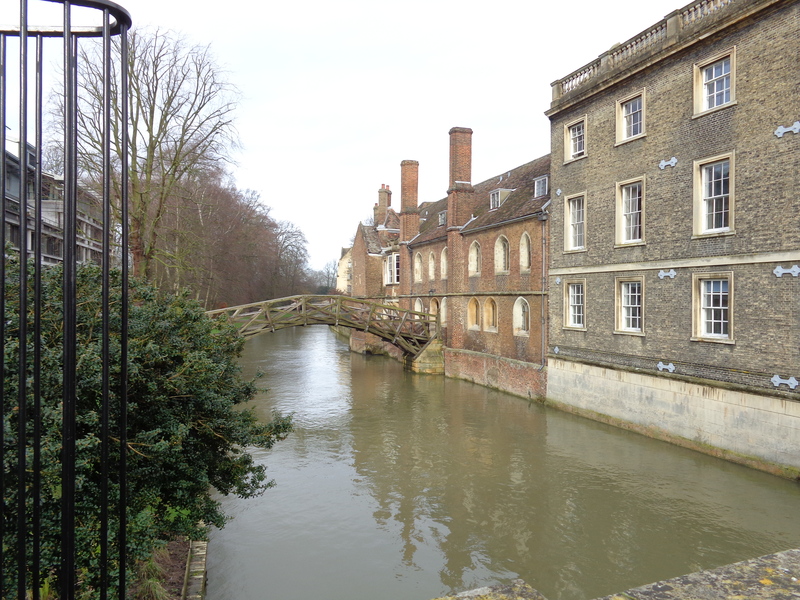 A well known bridge over the river Cam that runs through Cambridge. We left for Cambridge on Saturday morning. Since this was just a day trip, we left after breakfast and were back in time for supper, which was nice. Our first stop was at the Cambridge American Cemetery. It was a beautiful morning. The cemetery is on the top of a hill with a great view of the countryside, so as soon as we got off the bus we could see for miles. Our group met our guide at the flagpole at one end of the cemetery. He explained that this was one of only two American cemeteries in Britain. It is the final resting ground of soldiers who served during WWII. Many of them died in training accidents when they were unable to make safe landings. Soldiers who fought all over the European Theater, from every state in the US are buried there. After the war, their families were contacted and asked if they would like their soldier to be buried in America. About 60% were brought back to the States and buried locally or in National Cemeteries like Arlington. So, because of all the gaps, it was rearranged into a fan shape. When standing at the flagpole, you can see from one end to the other, and the crosses stretch as far as the eye can see. It’s breathtaking. Our guide also told us that crews come to clean the headstones three times a week! During our tour, the clock struck 10:00, and the chapel’s bells rang out the hour before playing three hymns, including “Just A Closer Walk With Thee.” Honestly, it brought a tear to my eye. Our guide told us the stories of several of the men buried in the cemetery and whose names were on the wall of the missing. This wall stretched the entire length of the cemetery leading to the chapel. On it were written the name of all the men (and one woman) whose bodies were missing at the end of the war. As remains have been identified, a rosette is placed by their name. We were told that the lady who was missing in action was a Red Cross nurse, and there are 18 more women who served in various capacities during the war who are buried in the cemetery, which I thought was pretty cool. After visiting the chapel, which had two really cool maps on the inside and outer wall, as well as stained glass with the seals of each state and medals of honor, we had a little bit of time for reflection before heading back to the bus. We headed into Cambridge right after that. We got a sack lunch, then walked into town. Some of my friends and I ate lunch on the steps of the University Press building. I didn’t see any signs for tours or anything, and I might have mistaken it for a church if I hadn’t seen the name in small print on the door. I was a little excited. Then we walked a little ways to the Fitzwilliam Museum. They had a wide collection, including armor, artwork by Picasso, and many, many other classic artists, Greek and Egyptian artifacts and a large porcelain collection. We spent quite a bit of time exploring there. We moved on to explore the rest of the city. Across from King’s College there was a neat little candy shop. It looked like it came straight out of a Willy Wonka movie. I bought a Chocolate Frog from Harry Potter, and my Chocolate Frog Card was Voldemort! From there, we found the Market. It was a lot like a Flea market in the States, but since we were in Cambridge most of the stalls were run by college students. I thought it was kind of funny that so many stalls were selling London souvenirs since we were in Cambridge, but the stuff was less expensive than what the shops in London were selling them for. As we were leaving, a Street Performer had just started his show. He rode and 8 foot tall unicycle, juggled knives and balls, and he was probably about our age, so it was pretty cool. We decided to explore a little more, and it wasn’t long before I found the Angel bookstore. I was in heaven. They had all kinds of books, and it was a really cute place. I bought a copy of the Hobbit, since I had been looking for one and I got a student discount. Right next door was a pub called The Eagle, where Watson and Crick announced their theories about DNA. After stopping at a neat old cafe called Fitzbillies for some Chelsea buns and again eating on the Cambridge University Press steps, we decided to use the hour and a half we had left to explore some of the parks. There were many places named after Jesus (Jesus Lane, Jesus Green, Jesus Pieces…) so we thought we’d find them. Well… that was a nice idea in theory, but we ignored the fact that the sky was getting darker the farther we walked. By the time we were in the middle of Jesus Green, the skies opened up and there was a HUGE downpour! And of course, there was no where to take shelter. Before long, the heavy rain turned to HAIL! It was pretty intense! We finally were able to cross the river and reach a bed and breakfast, where the men in the lobby were nice enough to let us come in and plan our next move… with my soaking wet map of Cambridge. It turns out we had wandered off the area it covered, but we were on the right road to meet the bus. So, we were soaking wet walking down a road beside the river. We had to dodge puddles, college guys carrying kayaks (Side note: I didn’t know people actually said “Cheers!” here, but these guys did) and more rain drops, as it had started drizzling again. When we finally made it to where the bus was supposed to be, we were ready to get on and go back. But… it wasn’t there yet. We were on time, but the bus was late. But hey, it did come, and we finally made it back to the manor in time for supper. I was ready to get out of my wet clothes since the water had managed to soak through all three layers of the long sleeved shirts I was wearing. In fact, it’s Monday night and my shoes are still not dry, so that should tell you how heavy the rain was. But, overall, it was a very nice trip. One of the fields we walked through on our walk Wednesday. My second week at Harlaxton is well underway. It feels like I’ve been here for a while, even though we’ve hardly spent two weeks actually at Harlaxton thanks to the London Trip. On Tuesday afternoon, our Shakespeare class took a coach BACK to London (I can’t seem to get away now…) and watched King Lear at the National Theatre. We had some free time, so a few of us went to the Tate Modern and accidently ran into a few paintings by Picasso and Salvador Dali. It was cool, but we got there right as it was closing so we didn’t see much other art. The performance of King Lear that night was unusual because in the middle of the scene, the actor who was playing Edmond (a very central character) suddenly lost his voice. At Intermission the director came on stage to tell the audience what had happened. He informed us that his understudy would be taking over. Though I was a little confused at first about why a secondary character was suddenly kissing a main character, I soon realized that he was the understudy. It was a very interesting performance, though I can’t say King Lear is my favorite Shakespeare play. Because the show was in the evening, we didn’t get back to Harlaxton until 2:00 am. I had planned on sleeping in, but that didn’t happen… around 6:45 in the morning, the fire alarm went off. As my roommate and I rushed down the hall, we the door to the steps we had planned on going down was blocked by a smiling British Studies professor. “You can’t go this way,” he explained. “There’s a fire here. You’ll have to find another route.” So, we followed everyone else to the other end of the house, where we went down one of the “secret passageways” in a small tower to a spiral staircase, which is the fire escape. It was cold outside at 6:50 in the morning before the sun came up, and I was pretty upset that I had been dragged out of bed after so little sleep. After lunch on Wednesday, we had the famous Harlaxton famous group picture in front of the manor. Then a group of us, led by Dr. Hanlon, went for a walk on the English countryside. The trails have been around for hundreds of years, cutting through fields, pastures and villages. Where fences block the path, there are stiles to cross the fence and little arrows that direct walkers to the next place the trail leads. Dr. Hanlon said it would not be impossible to walk all the way across the country on these paths. We walked to Denton, which is only about a mile away from Harlaxton. This was one of my favorite afternoons. The fun part was, everything was really, really muddy!! I was very glad I had packed my work boots. There were just enough hills to make the hike interesting. We returned to the manor on a different path, passing reservoir and canal. By the time we returned to the manor, we had walked nearly 4 miles! One good thing about living in a manor is, between the stairs, walking on weekend trips and walking across the country, I should be in good shape by the end of the semester! Lelia and I went to town to pick up a few odds and ends, as well as getting my watch resized. We had a few awkward moments with the locals (She never came in here! She just stayed on the street!) and then came back to the manor. Things have been busy these past few evenings. There’s almost always some kind of club meeting (C.S. Lewis/J.R.R. Tolkien, Christian Fellowship), Monday nights are House competitions, and basketball season has started up (Go Lions!). I’m still very thankful that most of my homework so far has been reading novels, though that’s not true for everyone. We will have a rare Friday class day to make up for long weekends in the weeks to come. Next up is a weekend trip to Cambridge that starts on Saturday, which I’m really excited about. We left for London at 6:30 on Thursday night. We stayed at the Royal National Hotel on the North side of the river. I met my two hotel mates, Lelia and Kelly, and we went up to our room to unpack. The room had 3 twin beds, a small bathroom and a few counters to for us to put our bags on. The room was much smaller than American hotel rooms, and even smaller than my room at the manor that I only shared with one person. When I grabbed my phone to check my messages over wifi, I realized… there was no Internet in our room! Gasp! To get Internet, guests have to go down to the lobby to get a temporary user name and password, then they have to stay in the lobby for as long as they need the Internet. Needless to say, that lobby was crowded during most evenings. On Friday morning, I met up with my friend Michelle to go to the Tower of London and the British Museum. We had bought our tickets before we left and printed out conformation paperwork. It was a good thing we did, since there was no way to print at the hotel and we saved a few £.She had looked up all the stops we needed to make to get to the Tower on the Tube, and with only one minor mishap (make sure you get on the train going the right direction) we made it to the Tower. This was my first time in one of the most famous areas of the city, and it was amazing. There was a huge contrast between all the new, modern buildings being constructed and all the old churches and pubs that had been there for hundreds of years. We explored the Tower of London for several hours, and we even got a group tour from one of the Beef Eaters! After taking some pictures of the Tower Bridge (not the London Bridge), we took the Tube again and moved on to an area of London called the Boroughs for lunch. After eating at a little (and I mean little!) place called Chicken Cottage, which seems to be a chain store, we set off for a prison museum called the Clink. It wasn’t as interesting as we thought it would be after paying a £5 admission. There weren’t any original furnishings since it had been built in 1144 and used for other purposes, but at least we can say we visited the oldest prison in England. For the last time that day, we took the Tube British Museum, which was only a few blocks from our hotel. There were mummies, Egyptian, Greece and Roman statues, wall carvings from Ninevah, and, one of the most exciting things for me, the Rosetta Stone. We spent HOURS looking at artifacts from all over the world, and we still missed about three rooms, mostly because several rooms were closed and we had to backtrack. We went back to the hotel and got supper at a pizza place on the main floor. I had noticed that one of the specials was Chicken pizza, so I ordered it… but it was not at all what I had expected. There was chicken, but there was also corn and onions… which I picked off. Yuck. After stopping by the lobby for some Internet, it was definitely time for bed. We had spent most of the day walking, and we had another full day Saturday. That morning, I had planned to go exploring by myself. That was really intimidating, so I was relieved when my friend Elizabeth agreed to go with me, since we both had a tour of the Churchill War Rooms in the afternoon. We set off for the short walk to the British Library, which was one of the places in London I was most excited about visiting. But…we were too early. So, we walked a little farther down the road to St. Pancras International, a train station which I found out later was used in some of the Harry Potter movies. Right across the street was the famous King’s Cross Station, so of course we had to visit there as well. After taking a picture at the cart disappearing into the wall at “Platform 9 3/4”, we walked back to the British Library, which was just opening. The first thing we could see when we walked in was the King’s Library, which are books collected by the monarchy over hundreds of years that only people with special permission are allowed to use for their research. My friend Elizabeth had visited the library the day before, so she showed me where the “Treasure Room” was. Original manuscripts from Jane Austen, handwritten lyrics by the Beatles, a Gutenburg Bible from the original printing, and a copy of Magna Carta were all on display here, along with many other rare manuscripts from around the world. It was one of the highlights of my London Weekend. I was a little disappointed when I tried to see the rest of the library. There are many reading rooms that contain more modern manuscripts for research. When I asked if I could look through them, I was informed that I needed a membership to enter them. From the Library, we took the very crowded Tube to the area of London known as Westminster, where many of the iconic and important buildings can be found. Our tour of the Churchill War Rooms was supposed to start at 1:00, but someone was running late. But, it was okay, because a Scottish Marching Band, complete with bagpipes marched halfway down the street where we were waiting. We soon saw that it was made up of teenagers, and they sounded really good! After waiting for what felt like forever, we finally walked down the stairs to the basement of a government building and entered the rooms that Churchill lived in while he was planning during WWII. There was also a museum dedicated to Churchill’s life, and I learned a lot about him. They had his Nobel Literature Prize, which was a book that had been bound in silver and inscribed on the front. After continuing through the museum and the other rooms that had been restored to the way they were during the war, I ate lunch at a little cafe in the heart of the War Rooms. I met some friends at the base of Big Ben, at 3:00, when I heard the Big Bell ring for the first time. That was another amazing moment. Our group explored the area, and we would have gone into Westminster Abbey, but it had already closed for the afternoon. We also found a statue of Abraham Lincoln in a garden across from the Abbey and Parliament building, which was unexpected but cool. Our group then took the tube to the part of London called Piccadilly (though we didn’t go to the circus part since some of the others had been there the day before) and we saw a little bit of Hyde Park (because the same people had already been there too). We stopped by the Hard Rock Cafe so Chelsea could get a shirt for her mom, and our group split for a while so some could see Buckingham Palace and others could eat supper. Chelsea and I decided Buckingham Palace is best seen in the daylight, not during twilight/evening. After we all came back together, we decided to take a bus to Waterloo so we could ride the London Eye. We confirmed our tickets around 6:30, then went for supper. Chelsea and I ate at a really nice Italian restaurant called Cucina. It was really fun to watch the interactions of the families eating supper around us. Riding the London Eye at Night was one of best investments we made during the entire trip. The city at night was beautiful! The Eye never stopped moving, so we had to step on as it was moving by, but the cars were really big and spacious. They were completely enclosed by glass, so we got a 360* view of the city. Several mounted tablets allowed us to tap landmarks on the screen that matched up with what we were viewing, and gave us more information about buildings we were interested in. It was one of the most fun experiences on the entire trip. Then our group took the Tube back and went to bed. On Sunday morning, we got up early to check out of our hotel and to visit Hampton Court. Many famous royals during the Tudor and Stewart period, including King Henry VIII and William II. But, it hasn’t been lived in by the royal family for hundreds of years, and it is now open to the public. It inspired some of the architecture for Harlaxton Manor, including the Greek-like towers on the roof. We had planned to visit the meadow where Magna Carta was signed, but the roads to get there were in bad shape for recent rains, so we returned to Harlaxton in time for supper. That’s what I thought after the first Lecture and Seminar on Monday morning. When a group presentation was assigned to be completed on Wednesday, I was a little worried. The British Studies class is set up in two parts. Lectures are Mondays in Wednesdays at 8:30 and they are mandatory for all students. Everyone goes and takes notes as one of the four professors talks at the front of the Long Gallery (the front is shown in my picture of the Convocation). After lecture, we are split up into seminars, which are smaller groups of about 20 students taught one of the four professors who teaches the lectures (we always have the same professor). Then we go over the information in more detail. The Lectures are unlike any class I have been in before. Taking a few pages worth of notes without having much information being shown on the PowerPoint was a lot different from what I was used to. Add that to a class full of 170 students, plus faculty, and I was suddenly in a class that I had dreaded since I had first started college. But honestly… it wasn’t so bad. I can keep up for the most part, and if I miss something, I can ask anyone that goes to school here. Finding people to compare notes with will be a breeze. And as for the group project… it wasn’t so bad either. It was assigned for seminar, and our professor was almost apologetic when she assigned it. It wasn’t a long, drawn out process to get the information ready, and since it was a group presentation, no one had to talk for very long. I’ve been assured that there will only be one other group project in this class for the rest of the semester (the third week of school), and I hope that’s the case. Other than British Studies, most of my homework so far has been reading, which is pretty nice for me. I don’t have a ton of huge papers assigned (until the end of the semester) and as an English major it’s really cool to read English stories, then look out the window and see the English landscape. In my British Novels class, we discussed how the landscape was used in the book, then walked out the door and my professor explained how people thought about the beauty of the land during the time the book was written. It was one of the coolest experiences I’ve had since I got here. I’ve been pleasantly surprised with the amount of down time I’ve gained. I don’t have to drive 45 minutes to school or work for a couple of hours each day, so I have some time to do what I want. A room downstairs has movies, games and guitars to rent, so I’ve been spending some time catching up on “must see” movies and attempting to teach myself how to play guitar. I know about two chords, and I hope to learn many more as the semester continues. I’m also getting to know a lot of the other students. Most of them are from the University of Evansville (UE), but many of those students are originally from all over the country, so there are all kinds of interesting people to talk to. I am one of the few people who only has one roommate. Many of the people who stay in the Carriage House have two. My roommate’s twin sister lives on the floor above us, and since the rooms are so big, there are four girls in the rooms. Even though it can be a pain at times, stairs have to be climbed to get anywhere in the manor. The good thing about this is, we’ll all be in good shape at the end of the semester. But, it can be tiring to walk up four flights of stairs at the end of a long day. Still, I’m amazed by this house every day.